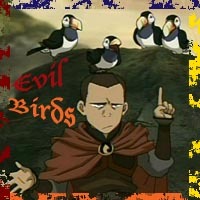 Sokka: Hey we're in enemy territory now these are enemy birds! Name Birdsfly as you already know. Likes: Avatar (Both the Movie with the blue aliens and the cartoon with the elements), Teen Titans, Zelda games, Inuyasha, Harmanie(my dog), Zutara(Avatar Zuko Katara), SessKags(Inuyasha's own fluffy and Kagome), Games, Drawing, Writing thats bout it for main. Dislikes: Little brother, Inyasha sometimes (The main character not the show), Jaken, bugs, Spiders, anything tinny with little legs, Little Bro, Sharp objects, Milk, Dark, little bumps in the night, oh and did I say little bro. Oh where I've been mainly at http://www.birdsfly25.deviantart.com/ and is also where most my pictures are. Haha have not updated this since the start of summer break. XDD School started 8-11-10 yeah I'm in school now. Anyway... been drawing more even gotten better at photoshop and color pencils. So yeah that bout it will be updating more and that's is it. Katara is thinking about Aang and what she thinks of her feeling to him. Poetry Kataang Short. READ CHAPTER 1 TO GET THE SUMMARY OF Bits and Peices!!!! Racer X is always there for Speed, right? Nice artwork and what's up?